Have you found a new home and are looking forward to a new beginning? Since you are not leaving Ohio, you are perhaps thinking that moving locally will be an easy thing to do. Well, maybe you should think twice. Although it is much faster and less exhausting than long distance moving, you still need to pack and move all your belongings safely. Unfortunately, there are numerous things that could go wrong. However, if you want your move to go smoothly, fast and stress-free, you should consider hiring the professionals – Zippy Shell Greater Columbus. We are one of the top-rated local movers Columbus Ohio offers, and we are here to do pack and move your items for you. The capital of Ohio state is perhaps best known for its unbridled passion for college football. The fierce loyalty for the Ohio State Buckeyes is a really significant part of life here. But, if you look past its scarlet and gray colors, you will see that this metro area has much more to offer than football. Columbus is home to art, music, theater, museums, and culture. On the first Saturday of every month, the Short North stays open late for art lovers to look at art, craft and eat free hors-d’oeuvres. Also, there are many art festivals that happen in and around Columbus. The Columbus Museum of Art offers an exquisite art collection. Thanks to the sprawling Ohio State University and an array of businesses, it also has an energetic and bustling workforce. A prosperous economy gives millennials around the world reasons to move to Columbus. Therefore, they are creating a young and fresh atmosphere throughout the city. There are many ways to have fun in Columbus, too. Don’t miss to go for a dinner or just drinks at some of the lively bars and restaurants in Short North. Take a walk to the charming, historic German Village and enjoy the outdoors in many parks and gardens. And yes, with their professional and college sports teams – residents are never left looking for entertainment. Before the moving day, it’s always a good idea to declutter your home. This way, you will avoid packing and moving things you no longer use. This will affect both, the number of your belongings, and the price of your moving accordingly. You will be surprised how much things you don’t really need. And remember, our local movers Columbus Ohio can help you with this task as well. From disassembling your furniture and safely packing your items to the transport, we will be there every step of the way. After packing the things you want to get rid of, we will also make sure your items are stored or disposed of safely. We offer modern, temperature controlled storage units in different sizes. We will help you choose the unit that suits perfectly your needs. Don’t worry about transport, we will pick up your belongings transport them to the storage. We are here to make local moving easier on you. When you wish to get some of them, we will deliver them to you in a blink of the eye. Also, if you wish to dispose of some items you no longer need, we are here to do that for you as well. Your things will be disposed of in environmentally friendly method by our local movers Columbus Ohio. Packing is the big and challengable part of every move. And actually, if you have that luxury, we advise packing the things some day before the moving day. As the old adage says, an early bird gets the worm. Packing things ahead gives you the opportunity to start your moving day early in the morning. 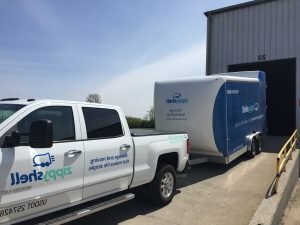 Local Columbus Ohio movers have all sorts of packing supplies available, and lots of packing experience. We are here to pack all your belongings in the most professional way. You don’t have to worry about carrying your belongings to the truck and back, we are here to do that for you. For this reason is very important to provide us with information about the size and amount of your belongings. This way we will be able to provide a sufficient number or movers and accurate moving estimate. Next step is transporting your things safely and efficiently to your new home. Many people make the mistake of renting a truck to move everything themselves, especially if they have never driven a truck before. Move day is not the best time to learn to drive a truck. When hiring our local movers Columbus Ohio, you don’t need to worry about a moving truck or transportation between locations, as we take care of everything for you. Once we arrive at your new home address, we carefully unload moving boxes and carry them into your home. What happens next? Well, that would be unpacking. Many people overlook this last step. Interestingly, this is often a moment when damage occurs. Relaxed because the moving is over, people tend to uncarefully unpack their boxes and break or damage them while doing it. If you want fast and damage-free unpacking, we offer this service as well. As a result, you will be able to enjoy your new home that same evening, without tripping over boxes. Our local movers Columbus Ohio will do their best to help you move and settle at your new home smoothly. Once moving is over, you can relax and enjoy decorating your new place. You will see how fast this once empty place becomes your home. As soon as your things cover the space, and you paint and decorate it in your favorite colors, it will become warm and familiar. And you really don’t need to spend a fortune to do that. A few nicely combined details can make a miracle. Enjoy your new place. Home is where your story begins.